English: Arching fountain of a Pahoehoe approximately 10 m high issuing from the western end of the 0740 vents, a series of spatter cones 170 m long, south of Pu‘u Kahaualea. 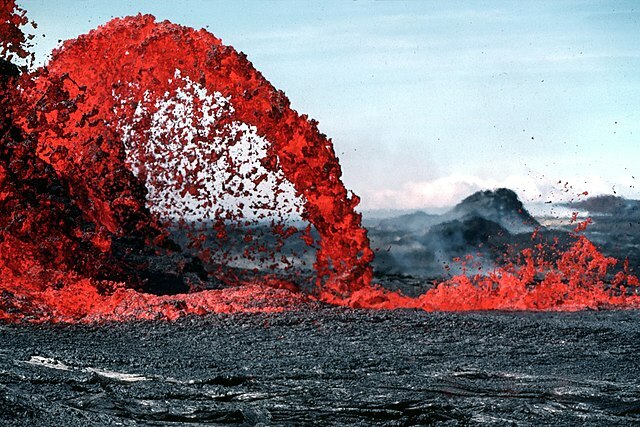 Episodes 2 and 3 were characterized by spatter and cinder cones, such as Pu‘u Halulu, which was 60 m high by episode 3. Português: Fonte de lava do tipo Pahoehoe de aproximadamente 10 m de altura em Kahaualea, Hawaii. Español: Fuente de lava del tipo Pahoehoe de aproximadamente 10 m de altura en Kahaualea, Hawaii. Français : Fontaine de lave de 10 m de haut environ. Hawaii. Русский: 10-метровый фонтан лавы, Гаваи, США. Tiếng Việt: Một dòng dung nham đang phun trào, Hawaii. Deutsch: Ca. 10 m hohe Lavafontaine im Süden des Pu‘u Kahaualea auf Hawaii. This image was selected as a picture of the week on the Persian Wikipedia for the 第10 week, 2011. This work is based on a work in the public domain. It has been digitally enhanced and/or modified. This derivative work has been (or is hereby) released into the public domain by its author, Mbz1. This applies worldwide. Mbz1 grants anyone the right to use this work for any purpose, without any conditions, unless such conditions are required by law. Portal:Commons:Imagen del año 2008/Fuente de lava del tipo Pahoehoe de aproximadamente 10 m de altura en Kahaualea, Hawai.